Why not consider the unique appeal of a romantic, magical, luxury wedding in Portugal celebrated with your closest friends and family at Casa Ferrel instead of opting for a more conventional ceremony at home, which can often be fraught with obstacles, challenges and unnecessary stress? 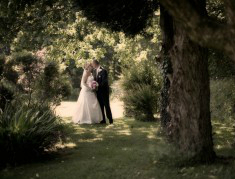 With its luxurious surroundings and spectacular setting, Casa Ferrel is a truly unique, idyllic and romantic venue to host a small to medium sized intimate wedding in Portugal with your nearest and dearest alongside you enjoying the most memorable occasion of your life. The beautifully manicured grounds of Casa Ferrel complete with olive groves and palm trees and multi terraced outdoor areas and outdoor swimming pool also adds to the appeal of an intimate and unforgettable outdoor wedding. Our sumptuous grand lounge and dining room can also act as elegant indoor function suites. With 8 bedrooms and flexible sleeping arrangements for up to 18 people, your immediate wedding party can stay in the luxurious surroundings of Casa Ferrel, while the local area of Praia da Luz has numerous hotels etc to accommodate your additional guests. 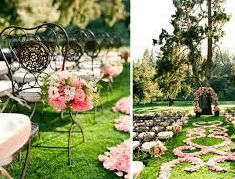 Planning a wedding at Casa Ferrel could not be easier no matter where you happen to be based. Either choose to arrange all the details yourself, or alternatively our experienced wedding coordinator will help plan your luxury Algarve wedding for you. We will organise the whole wedding process, ensuring that your big day will be perfect down to the finest detail. 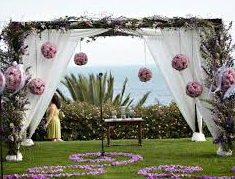 Your private and personalised ceremony, with legal validity, can be held at any time of day or night, either in the grounds of Casa Ferrel or on one of the beautiful beaches in the area.Â Choose a sunset ceremony followed by a candle lit dinner reception, or maybe youâ€™d prefer a barefoot beach ceremony with the faint Mediterranean breeze warming your skin? The choice is yours as you can create the wedding of your dreams at Casa Ferrel. 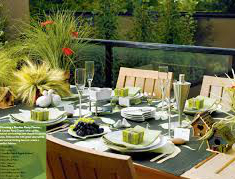 Our very own award winning chef will prepare delicious menus tailored to meet your individual taste and requirements, while our friendly and well trained staff will guarantee that everything runs smoothly, ensuring that you and your guests will dine on first class cuisine, in comfort and in style. Therefore, whatever you requirements may be, weâ€™ll be more than happy to tailor your wedding in Portugal to suit your individual needs and preferences.